I’ve heard of husbands asking their wives what they wanted for their anniversary or birthday, and getting a reply like “Oh, I don’t want you to make a fuss”, or something like that, and the husband actually not getting or doing anything to make a fuss, only to find out the hard way that wasn’t exactly what their wives had in mind. I thought I was too smart for that. Now we know. If any of you were to ask what I plan to do now, my official answer is “catch the camera” of course (so don’t even bother asking until after such a situation arises). But you might want to keep in mind that, although it depends on the state of your marriage at the time, I’m guessing for most of you it would be a lot cheaper and less hassle and agony to replace the camera equipment than the marriage. Just saying. Act accordingly. The only thing is that if you are stupid enough to ask a question like that, then either action will earn you some grief. I’m sure you’ll recognize that the grief can only be considered self-inflicted and you’ll do the right thing. 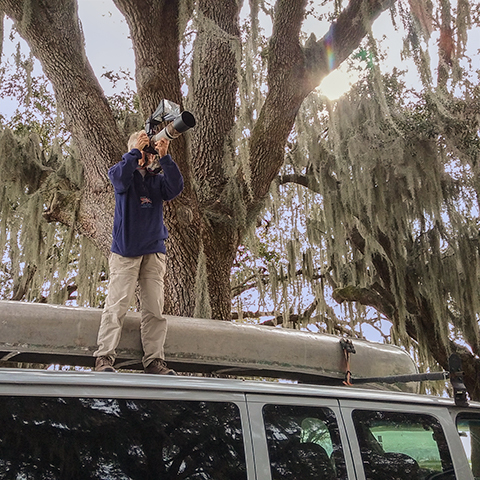 Nancy at Lake Wailes Park taking pictures of great horned owl chicks in a nest in the fork of a tree. My hands were full (as explained below) and I didn’t yet have a smart phone with a camera when Nancy got the osprey shots, so the above picture is for illustration purposes only. This picture was taken with the Samsung Galaxy J1. It has a 5-megapixel camera, which would be fine for things like this blog if the focus wasn’t so bad. Other things I didn’t like about the camera were the shortcuts constantly disappearing and the battery life deteriorating terribly in less than six months. I finally had to replace it with a Motorola Turbo after eight months because I outgrew the 8 GB of memory (I added a 32 GB SD card, but since apps typically stored only half of the program on the SD card, there’s no point in getting an SD card much larger than 8 GB). The baby owl she is taking a picture of in this picture is much lower in the tree and she feels no need to stand on the canoe behind her to risk her life for the shot. The flash is mounted on the camera. Normally, she uses a Pocket Wizardwebsite remote trigger, with a miniTT1 transmitter on the camera and FlexTT5 transceiver on the flash. The flash is then held by a voice-controlled semi-autonomous mobile bipod (that would be me). In either case, the Better Beamerreview attached to the flash does a good job of focusing the flash so it can reach farther into the canopy on her bird images.